Do you remember Casper the Friendly ghost cartoon? Well, these little guys are the jolly ghosts! They were inspired by a spool of ribbon I bought (pictured below), and were made using a Santa head (upside-down) cookie cutter from THIS Wilton set. Simply sweet! The cutter worked out perfectly for the knobby little fingers and curly Q "tails". 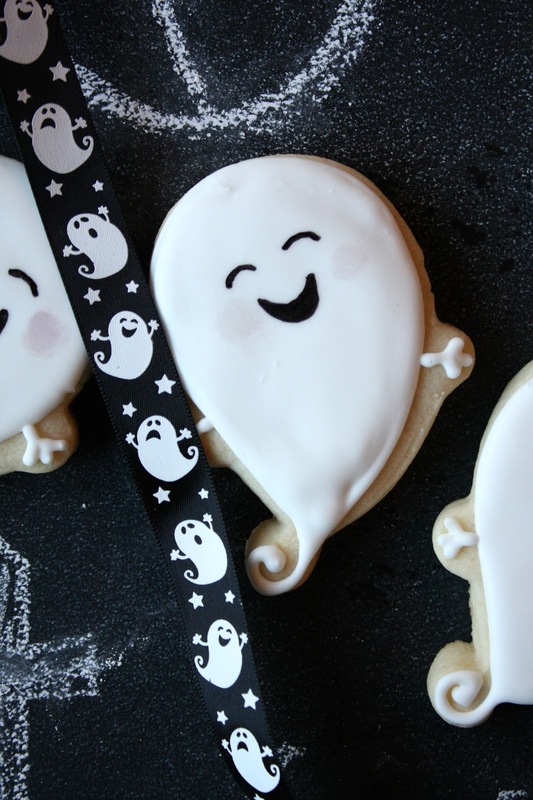 The ghosts were so easy to make: tinting the royal icing is optional (I added AmeriColor bright white), and a food marker was used for the facial details. I love when simple coincides with cute! 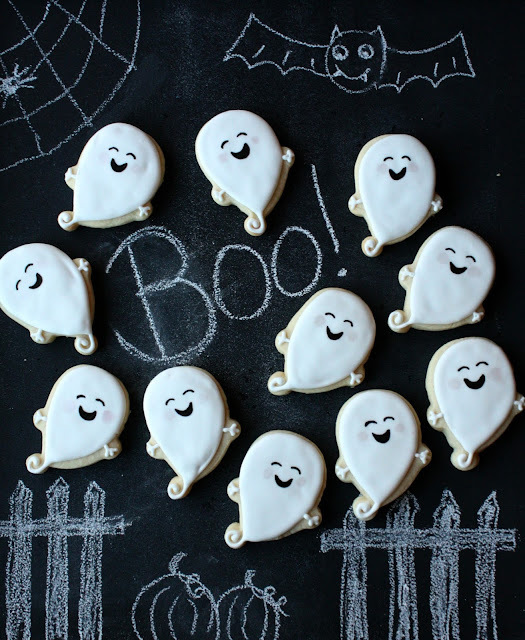 Though these ghosts shout out a collective "BOO! ", I don't think they're going to scare anybody. 2. 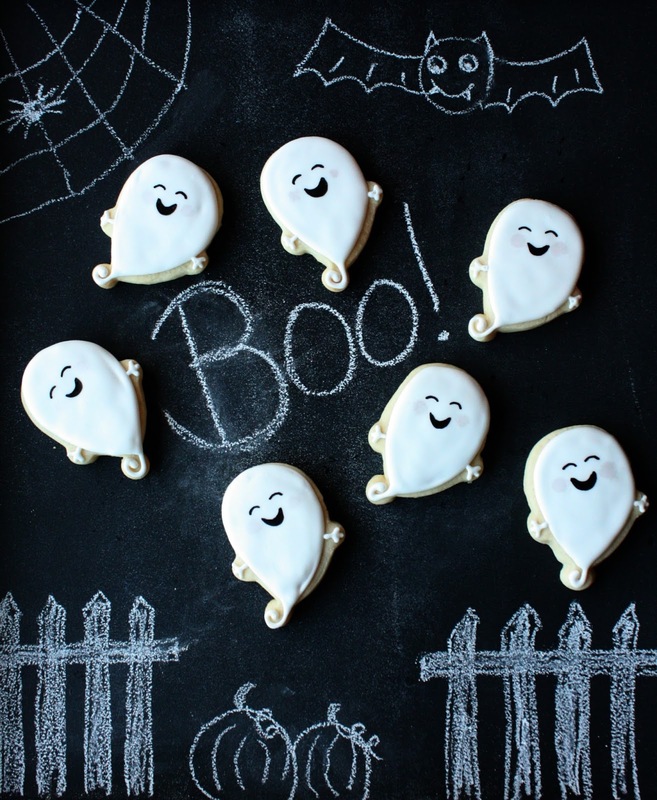 Place white royal icing (may add white food coloring for a more solid white) in decorating bag fitted with a #3 tip. 3. Outline cookie (including the curly Q "tail") with the icing and then fill it in immediately with the royal icing. (The icing should be of medium consistency, thick enough for the outline and loose enough to fill it. 4. Add the arms/hands with a #2 tip. 5. Allow cookies to dry completely, about 6 hours, or overnight. 6. Use the food marker to add the eyes and mouth. 7. Add the cheeks with a cotton swab dipped into to the luster dust, and dabbed on. I loved Casper. These cookies are so cute! These are just too dang cute! Oh WOW they ARE JOLLY! I love these Sue!!!!!! These are just so perfect! So darling! My girls would have loved these when they were little!